2 years ago I made a very short (half a day) trip to Heidelberg, Germany. Yes, a town famous for a special castle – but unfortunately I never got to see this castle up close, therefore sometime I’ll have to go back there. Walking down the streets at some point I entered a souvenir shop. There I saw many, many interesting objects – and I bought several as souvenirs for my mother, my friends and myself. But part of my soul remained there along with a special cuckoo clock. 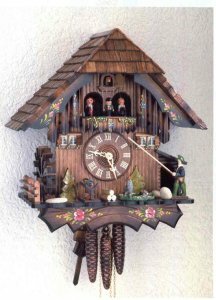 First of all I have to tell you that I simply love cuckoo clocks. I had one at my mother’s home, whan I was a child (unfortunately it was broken for a long time and no one could fix it properly). Then, in this souvenir shop there were many cuckoo clocks – with prices varying from around 30-40 EUR (for a small one) to much more. I wonder how many people like such clocks?